The most impressive part of the Guernsey defences in size, Batterie Mirus, will be partly opened to the public in the future. 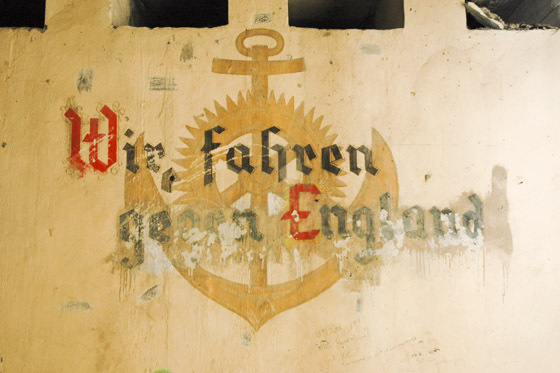 Gun emplacement No.1’s new owner is a supporter of the Festung Guernsey association and has allowed them to clean up the place and make it suitable for group visits. It will be a major job and it will take time. Paul Bourgaize of Festung Guernsey on the matter: “We are aiming to get the Mirus site secured and cleared this year. We will be fitting a large diesel generator back into the plant room to power the lights, and also clear out the field defences above ground. We can then take guided tours around the site safely. We have plenty of photos and interpretation material to put around the bunker. Possibly long term we can open the site on a regular basis”.